NEW YORK, NEW YORK - Coming off a state record in the DMR on Friday night where the Warrior Project, aka Weddington, ran 10:08.36 to improve on Green Hope's 10:15.86. Will Mazur, Emerson Douds, Jake Toomey and Kyle Durham split 3:11.22, 48.77, 1:55.39 and 4:12.96 over the 4000m relay. The Warriors would finish 4th in the event securing All-American status along with the state record. Today their team of Mazur, Toomey, Jackson O'Hara and Durham would compete again against the best 4x800m teams in the country. 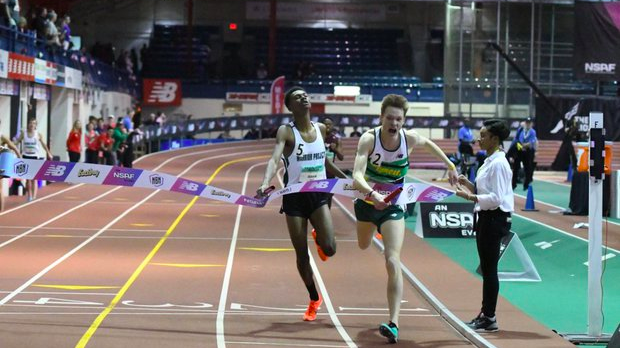 The favorite, Loudoun Valley, won the DMR in National Record fashion and also won the 4xMile with a National Record time earlier in the day. Like he did in the DMR, Mazur would lead off. Despite a little bit of contact in the race he was able to hand off in 5th just off the lead in 1:58.21. The leader handed off in 1:56.06. Toomey would get the baton looking to make up the few seconds on the lead. National leader coming in St. Benedict's Prep (NJ) would move up to the lead, and Toomey would be in chase. St. Benedict's Prep would hold onto the lead, but Toomey handed off in a big PR of 1:54.38, .6 seconds off the New Jersey squad. Loudoun Valley was about 2 seconds behind Weddington in 3rd. Loudoun Valley had their strongest leg on the third leg in Sam Affolder, who split 4:06 for the mile twice over the weekend already. Affolder would immediately chase the lead and overtake St. Benedict's Prep and Weddington. O'Hara would move up to 2nd trying to stay in striking distance. Affolder threw down a 1:51.36 giving them a 2 second lead over Weddington going into anchor leg. O'Hara would clock a 1:55.22 split on the third leg. St. Benedict's Prep would hand off in third, as Durham would have to run down Jacob Hunter of Loudoun Valley and hold off the nations top 800m runner Alfred Chawonza who has run 1:50.57 this indoor season. Over the first three laps the gap between Hunter and Durham would close as the race went on. With 300m to go Durham had caught Hunter and sat on his shoulder. Hunter picked up the pace on the final lap, but Durham would not go away. However, he would not give up the lead as he was able to hold off the Warriors clocking 7:40.49 to 7:40.65. Kyle Durham ran incredibly on the anchor leg running a PR of 1:52.84. Last year Green Hope ran a US#5 All-Time Indoors 4x800m at the national meet also taking second. Weddington took down their state record after only a year and moved up to US#4 All-Time with Green Hope moving to US#7 All-Time. It's was safe to say Green Hope made both the indoor and outdoor 4x800m relays one of the hardest to break with their 7:41.43 Indoors and 7:32.06 Outdoors. Weddington taking it down only one year later is incredible.